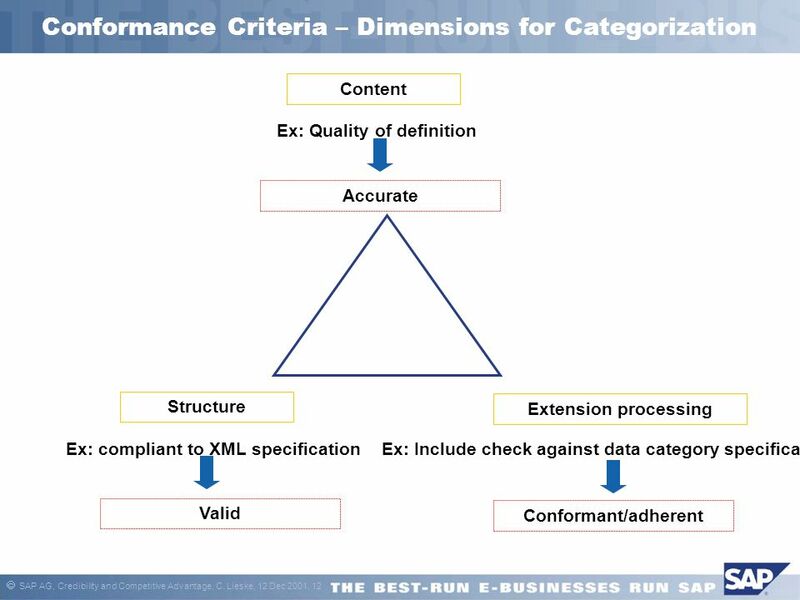 Credibility and Competitive Advantage - Thoughts on OLIF Conformance Assessment - Christian Lieske SAP AG - GBU Application Integration – MultiLingual. 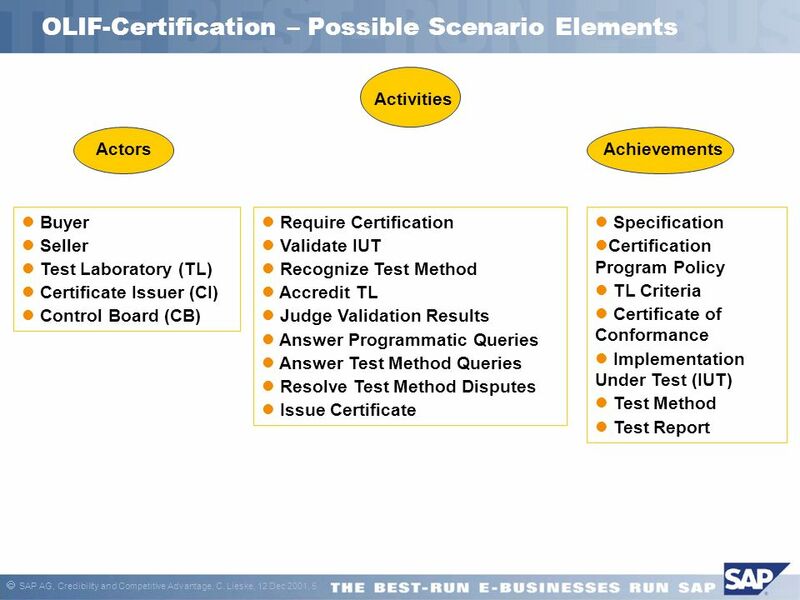 8 SAP AG, Credibility and Competitive Advantage, C. Lieske, 12 Dec 2001, 8 OLIF-Certification – Business Issues Who owns (in terms of copyright and intellectual property) the various elements of the certification? 1. OLIF logo 2. 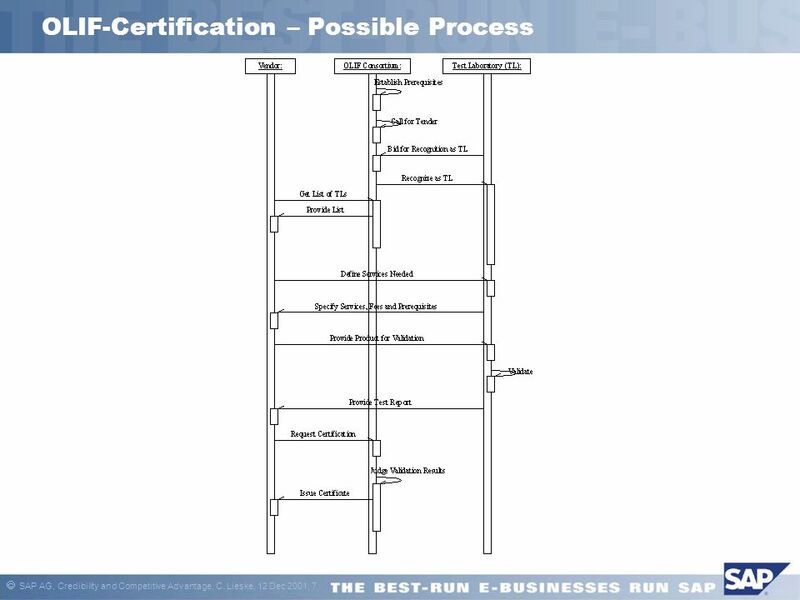 Overall certification process/programme 3. Logo for certification mark 4. 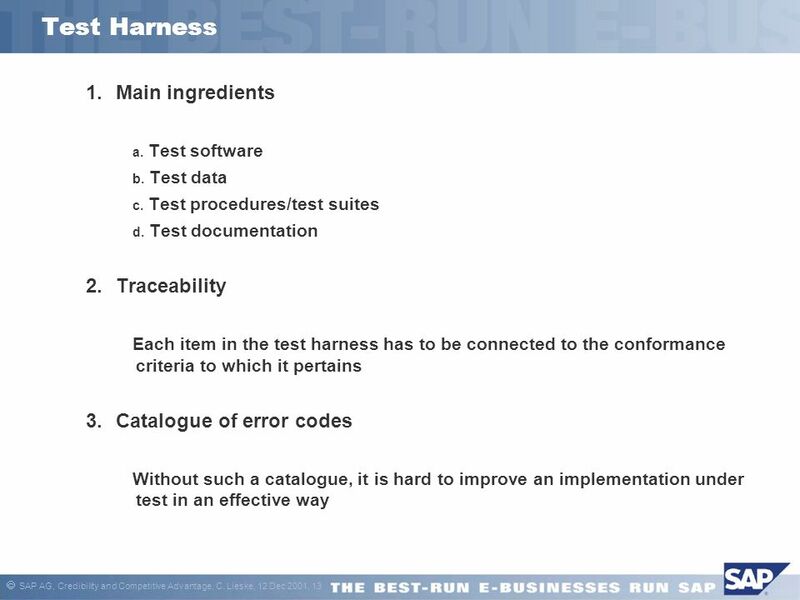 Test harness How are costs and revenues distributed? 1. Costs for ramp-up of certification process 2. Costs for validation 3. 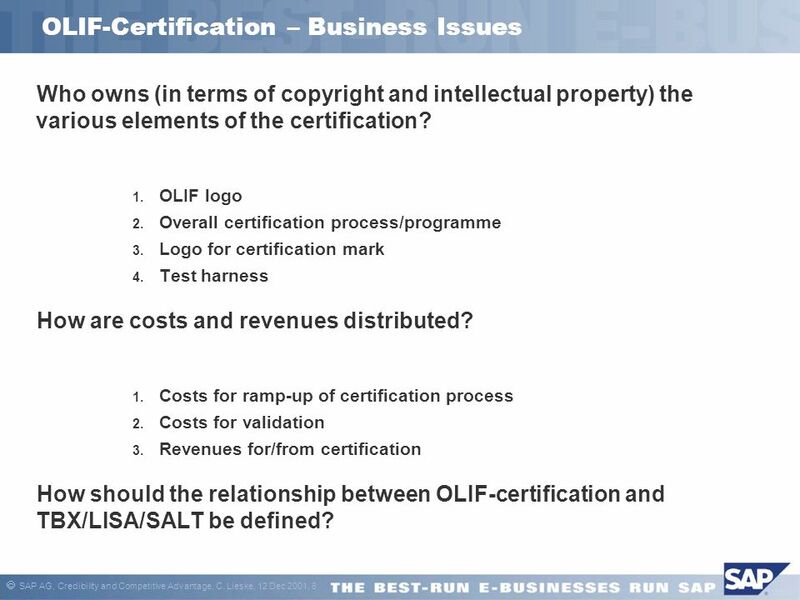 Revenues for/from certification How should the relationship between OLIF-certification and TBX/LISA/SALT be defined? 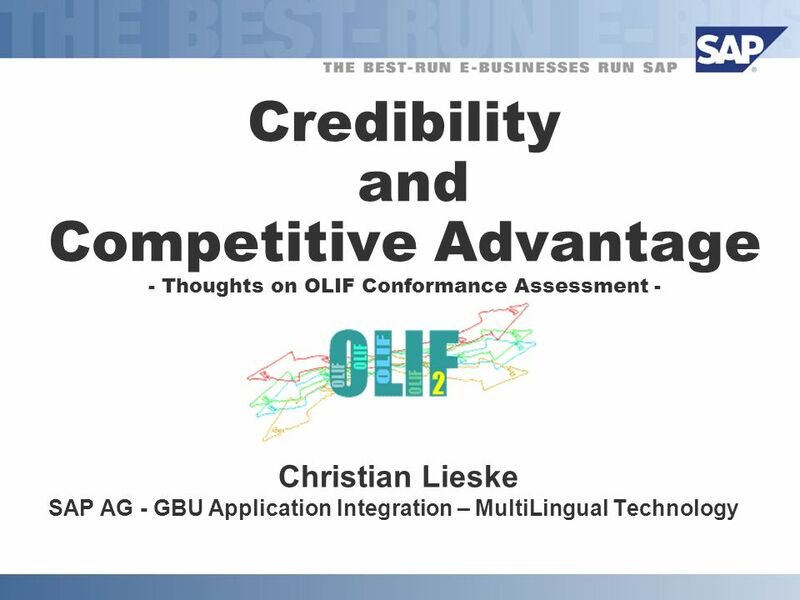 Download ppt "Credibility and Competitive Advantage - Thoughts on OLIF Conformance Assessment - Christian Lieske SAP AG - GBU Application Integration – MultiLingual." Using OLIF, The Open Lexicon Interchange Format Susan McCormick OLIF2 Consortium October 1, 2004. Does It Fit? 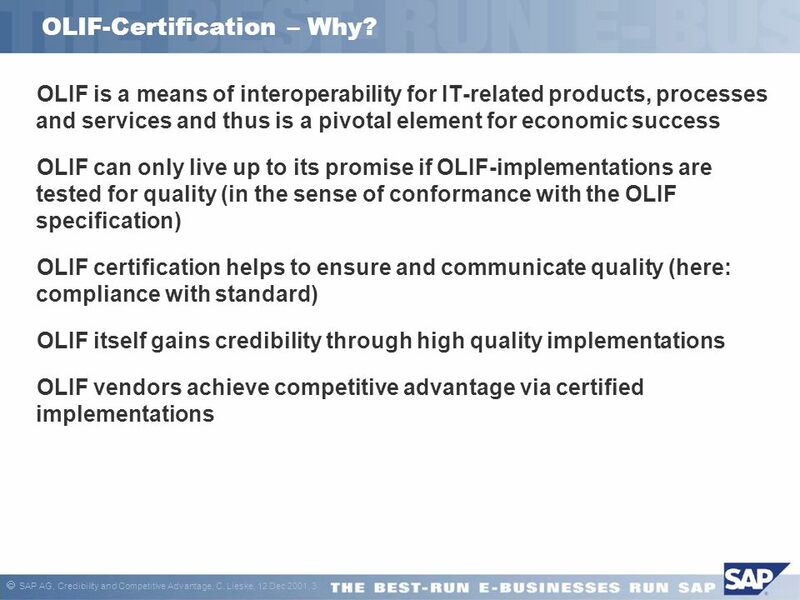 Review of the Proposal for OLIF (version 2) DTD Christian Lieske SAP AG - GBU Application Integration – MultiLingual Technology. Can I Use It, and If so, How? 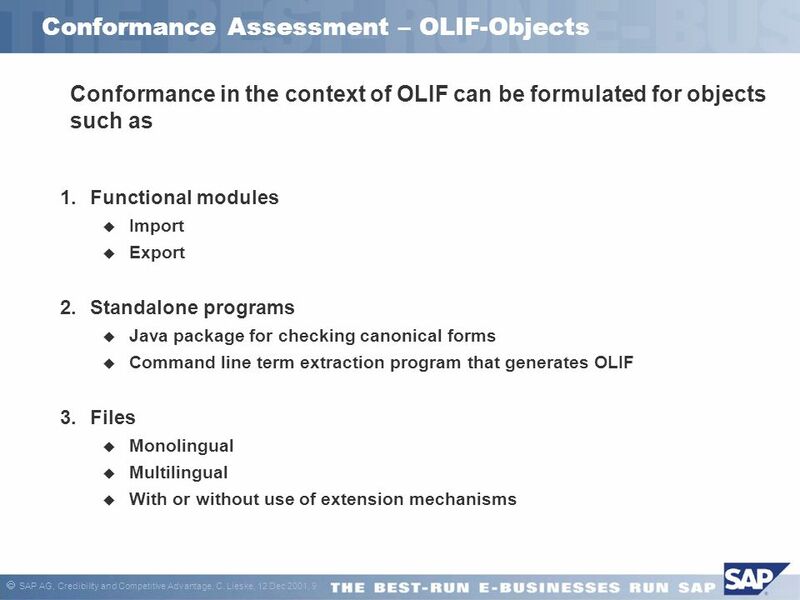 Christian Lieske SAP AG – MultiLingual Technology Discussion of Consortium Proposal for OLIF2 File Header. OLIF2 Consortium Review Meeting April 4, 2001 Walldorf, Germany. Possible Changes to OLIF 2.1. General Issues Japanese. 1 of 18 Information Dissemination New Digital Opportunities IMARK Investing in Information for Development Information Dissemination New Digital Opportunities. 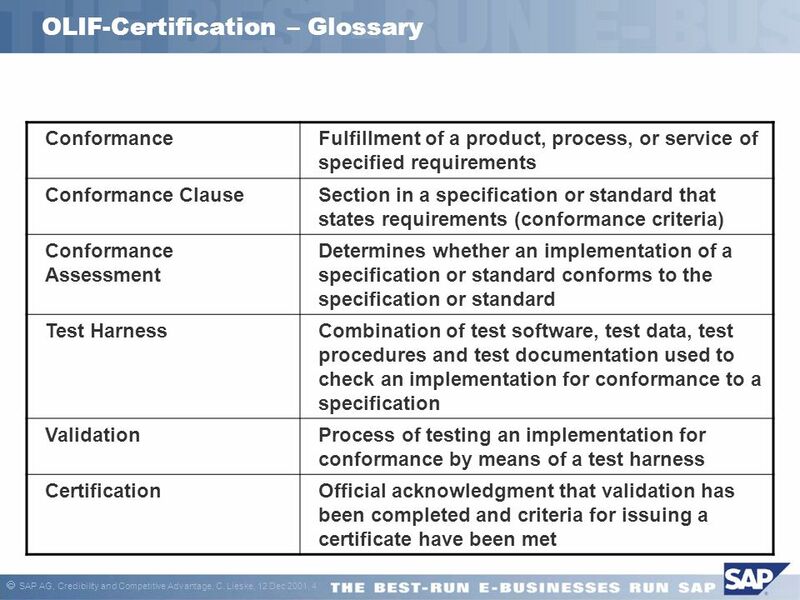 EHR-S Conformance Considerations Lynne S. Rosenthal National Institute of Standards and Technology August 2004. © 2006 Open Grid Forum GridRPC Interoperability Test Response to comments Yusuke Tanimura. EUROPEAN COMMISSION Social and economic cohesion OPEN DAYS 2006 The European Week of Regions and Cities Brussels, 9 – 12 October 2006 _________________________. 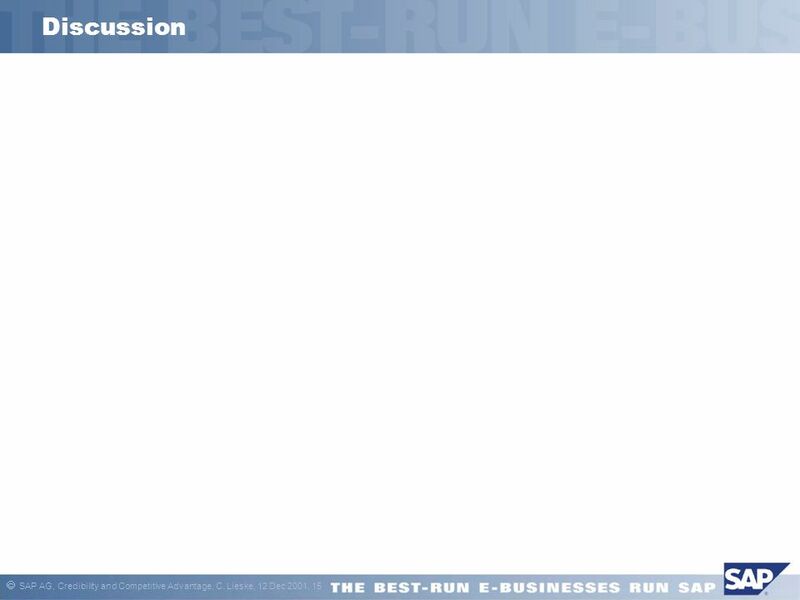 The following 10 questions test your knowledge of desired configuration management in Configuration Manager 2007. Configuration Manager Desired Configuration.